Cisco and Salesforce announced a strategic alliance in a press release on Thursday. According to CRN, partners are “pumped” about it. Before reading further, I would not have thought this relevant to IoT. 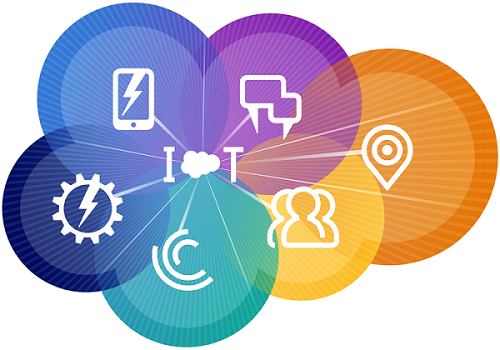 Although I’m quite familiar with salesforce automation in general and the Salesforce platform in particular, I wasn’t aware of the Salesforce IoT use case. Turns out it’s rather fascinating. According to the release, “The two companies will jointly develop and market solutions that join Cisco’s collaboration, IoT and contact center platforms with Salesforce Sales Cloud, IoT Cloud and Service Cloud. Indeed, as I’ve stated with my ‘tree falls’ analogy; gathering data that’s not subsequently put to use benefits no one. And Mr. Bosworth points out that, unfortunately, putting data to use is not the norm. Exactly. Not just gathering, but making use of IoT data. The two companies gave the example of a fleet of trucks connected with IoT devices managed by Cisco Jasper passing data back to the Salesforce IoT cloud, where a business can provide customers real-time delivery updates or maintenance alerts. Cisco solidified its move into the IoT market in back February by acquiring Jasper Technologies,’ provider of a cloud-based IoT service platform that enables companies to launch, manage and monetize IoT services – from cars to jet engines to implanted pacemakers. The new IoT integrations are expected to be available in the second half of 2017 and pricing will be announced at that time.